The Storm Rolling Thunder 3 Ball Roller is better than ever with this modern design! 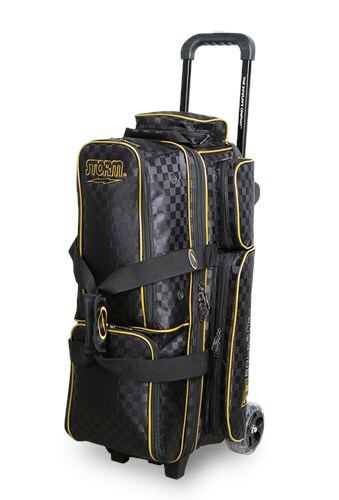 This bag has the same great features Storm is known for with the Rolling Thunder series, but has redesigned this bag for bigger and better details including upgraded grip release that extends to 41" AND extra room for fingers! Handle Extends up to 41"
Due to the time it takes to produce the Storm Rolling Thunder 3 Ball Roller Checkered Black/Gold ball it will ship in immediately. We cannot ship this ball outside the United States.